I’m a really not a bread person. Truth be told, my wife A is more the bread lover in family. I would prefer to tuck into a bowl of noodles or a cup of rice before munching on a croissant. To each his own, I guess. But since our delightfully eye-opening visit to Grandaisy Bakery, I’ve been reconsidering my views on bread. I’ve been looking to upgrade my bread choices beyond sliced bread. In our kitchen, bread definitely needs a re-evaluation. We still buy our store-bought Gardenia Whole Wheat Bread. But lately, we’ve been buying French Sourdough and Baguettes from Lartizan on a more regular basis. While I don’t see rice fall out of the family diet anytime soon, I think the continuing search for more artisanal breads will be higher on the pantry priority list. So for this conversation, the questions are as follows: What kind of bread do you buy? And where do you buy it? Our daily bread is Classic Gardenia White Bread from the supermarket. However, we don’t stop there in terms of variety– we buy from different sources depending on what we want. If it’s the traditional coiled Ensaymada, we get those from the sari-sari store around the corner. We love the Spanish Bread from Sonya’s Garden — the distance isn’t much of a big deal considering we eat spanish bread rarely (and its purchase is secondary to whatever we came to Tagaytay for). On Sundays we get Pan de Sal from Casa Marcos. Also, we love the bread at Restaurant Uno (Tomas Morato)– they have 2 kinds of bread made specifically for that day of the week. We particularly like the Butter Logs and Ciabatta. Depends what it’s for. We get Gardenia White Bread from the supermarket as our staple at home (usually for our son’s kaya toast). For snacks and baon, I buy filled and topped ones from Bread Talk (cheezy and plain flossy bread, chocolate “baby”). For bread to give away (Pan de Sal for my lola, Croissants for aunties), I get them in The French Baker. I buy bread from two places – the grocery (usually Robinsons or Market Market) or our neighborhood bakeshop here in Merville. I buy several packs of Wheat and White Loaves, Flat Bread and the occasional Baguette or Sourdough. I don’t have one purveyor for bread. I like to go to Santi’s on Tuesday or Wednesday when they have their Walnut Bread fresh from their source. I like the nuttiness of the walnut, the chewiness of the bread. Goes well with chevre and cold cuts. I do get a few breads, Pan de Sals, Wheat Breads from the markets (Salcedo, or Lung Center) – I think one of the sources is Uncle George, they do several breads for diabetics, but it doesn’t taste like sawdust. Commercially, there’s Walter’s Sugar-free Wheat Bread, it’s easily available in the supermarkets, and has less sugar. I don’t eat white sliced bread, they tend to be bland and tasteless; I do prefer a heartier Rye or Wheat Bread. The french food vendor at Salcedo has a good rye! And when I remember, I buy Pumpernickel from Santi’s or the German Deli in Legaspi Village because sometimes I feel like Heidi, black bread, cheese, and some goat milk. No, I don’t yodel while I eat this. 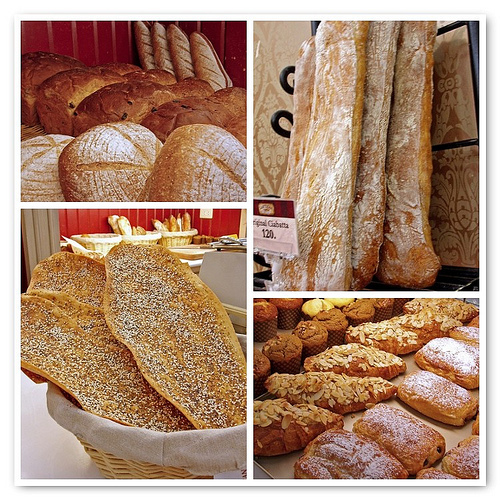 What kind of bread do you buy?– Croissants, Sourdough Loaves, Tortilla Rolls and Baguettes. JiPan in Mandaluyong has this Walnut Wheat Bread that’s soft, a little on the sweet side, and good enough to eat on its own. My husband and I appreciate The French Baker‘s Crustless Breads, perfect for tuna and grilled cheese sandwiches on our sandwich maker. Pan de Manila has freshly baked, bromate-free Wheat Pan de Sal that’s lovely to eat with clotted cream and strawberry jam. It’s like a soft scone. Thank you to Manggy, Marla, ApplesH, Mila, Lori and Cathy for breaking bread with me. I'm with Mila on Santi's walnut bread...yum! I also like the sourdough bread and pain au chocolat of O’Pain de Campagne at the Legazpi and Salcedo markets :) Have to try Lartizan soon! I wonder where the bread of Santi's is baked? hope your pampanga food trip went well! It appears a lot of people like Gardenia... except for myself. I love bread and I'm looking forward to try Lartizan. Cheers! Hi ChichaJo. Must try that Walnut Bread. Hi hpf. No worries. And yes, Pampanga went well. Just wish I had more than one stomach. Lartizan at Mickey's is a great addition to the meager choices available to bread lovers. Their Original Ciabatta is one of my favorites. Whenever I buy it, I can't resist sticking my nose in the bag and taking in its aroma! Their sourdough is good, too, and the whole wheat croissant is also worth a try -- very different from regular croissant, soft, with a molasses-like flavor. You can still buy the pan de sal here in Scout Tobias, Quezon City (parallel to Tomas Morato). Unfortunately the restaurant, which I've never eaten in, is closed, far as I know.